New course, "Supervised Learning with scikit-learn", taught by Andreas Müller! Become a machine learning master with this course. Hello everyone! Today we're also launching a new course on Supervised Learning with scikit-learn by Andreas Müller! At the end of the day, the value of Data Scientists rests on their ability to describe the world and to make predictions. Machine Learning is the field of teaching machines and computers to learn from existing data to make predictions on new data - will a given tumor be benign or malignant? Which of your customers will take their business elsewhere? Is a particular email spam or not? In this course, you'll learn how to use Python to perform supervised learning, an essential component of Machine Learning. You'll learn how to build predictive models, how to tune their parameters and how to tell how well they will perform on unseen data, all the while using real world datasets. You'll do so using scikit-learn, one of the most popular and user-friendly machine learning libraries for Python. 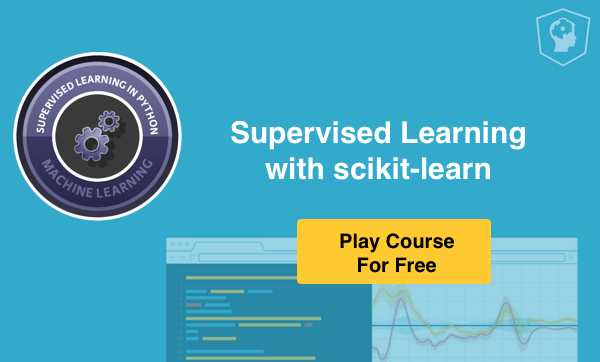 Supervised Learning with scikit-learn features interactive exercises that combine high-quality video, in-browser coding, and gamification for an engaging learning experience that will make you a master at machine learning with scikit-learn! In the first chapter, you will be introduced to classification problems and learn how to solve them using supervised learning techniques. Classification problems are prevalent in a variety of domains, ranging from finance to healthcare. Here, you will have the chance to apply what you are learning to a political dataset, where you classify the party affiliation of United States Congressmen based on their voting records. The second chapter focuses on regression, which is best suited to solving problems that require continuous outcome. You will learn about fundamental concepts in regression and apply them to predict the life expectancy in a given country using Gapminder data. Having trained your model, your next task is to evaluate its performance. What metrics can you use to gauge how good your model is? So far, you have used accuracy for classification and R-squared for regression. In this chapter, you will learn about some of the other metrics available in scikit-learn that will allow you to assess your model's performance in a more nuanced manner. You will then learn to optimize both your classification as well as regression models using hyperparameter tuning. The final chapter will introduce the notion of pipelines and how scikit-learn allows for transformers and estimators to be chained together and used as a single unit. Pre-processing techniques will be then be introduced as a way to enhance model performance and pipelines will be the glue that ties together concepts in the prior chapters. About Andreas: Andy is a lecturer at the Data Science Institute at Columbia University and author of the O'Reilly book "Introduction to machine learning with Python", describing a practical approach to machine learning with python and scikit-learn. He is one of the core developers of the scikit-learn machine learning library, and he has been co-maintaining it for several years. He's also a Software Carpentry instructor. In the past, he worked at the NYU Center for Data Science on open source and open science, and as a Machine Learning Scientist at Amazon. His mission is to create open tools to lower the barrier of entry for machine learning applications, promote reproducible science and democratize the access to high-quality machine learning algorithms.